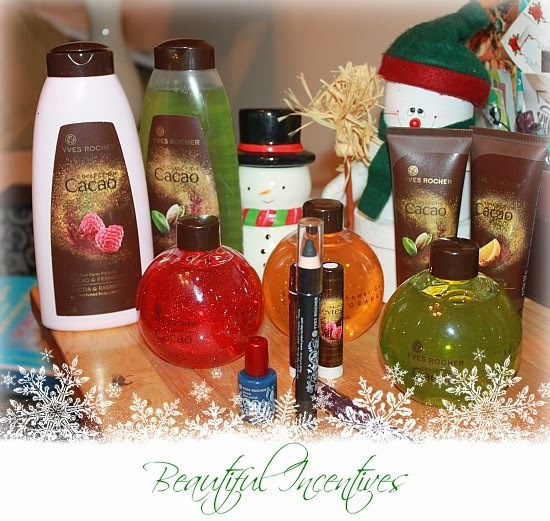 Beautiful Incentives: Get sparkling and yummy smelling with Yves Rocher's Holiday collection! Get sparkling and yummy smelling with Yves Rocher's Holiday collection! This post is inspired by Yves Rocher. I received product for evaluation. All opinions are my own. One of the biggest things I get excited for during the holidays is all the yummy fruity and spicy scents. Whether it be cinnamon, chocolate and cherries or vanilla, I love it all. What's more fun is when you discover new scents in bath and body that you've never tried before. Yves Rocher's Cocao collection is full of scent fusions that I have never tried in my life and each and every one of the scents is so yummy that I just want to eat my hands when I smell them. I have been using this collection almost every day for the month that I have been testing everything out. If you are a fan of chocolate, pistachios, fruits and vanilla, you will not be disappointed with this! Cocoa Sparkling body wash ( in the globes pictured) in the scents Cocoa & Raspberry , Cocoa and Pistachio, and Cocoa and Orange. They all smell amazing and leave a hint of fine sparkle glitter on your body. Cocoa hand creams ( pictured in the brown bottles) I received are in Cocoa & Orange and Cocoa & Pistachio. They smell exactly like the body washes and leave a long lasting scent on my hands. I can't get enough of these and always reapply during the day. Cocoa body wash without sparkle ( pictured in the larger green bottle), in the scents Cocoa & Pistachio and Cocoa & Raspberry. The Raspberry is like something I have smelled before long ago and I love it. The Pistachio is also very inviting and unique. A very different kind of scent that is really growing on me. Cocoa body lotion in the scent Cocoa and Raspberry (pictured in the larger pink bottle) and this stuff really lingers on you. I rubbed it all over and it lasted forever. The lotion itself is very moisturizing as well. 2 Cocoa moisturizing lip balms in scents Cocoa & Pistachio and Cocoa & Raspberry. These are plain lip balms that leave no tint, but lots of moisture and a light scent. These are extremely emollient and great for protecting against chapped lips! I layer all the products a lot, starting with the shower gel, followed by the body lotion and hand creme. I keep the hand cream and lip balms in my purse for re-application. I LOVE them. These scents remind me of a fruity chocolatey desert, so if you want to be devoured I suggest you get your hands on this bath and body collection! Best of all? They are all Paraben Free! These also come in Cocoa & Vanilla, which I have not tried! I also received a few samples from their holiday cosmetics line. Shown above: Nail polish- In the color Bleu Ardoise. 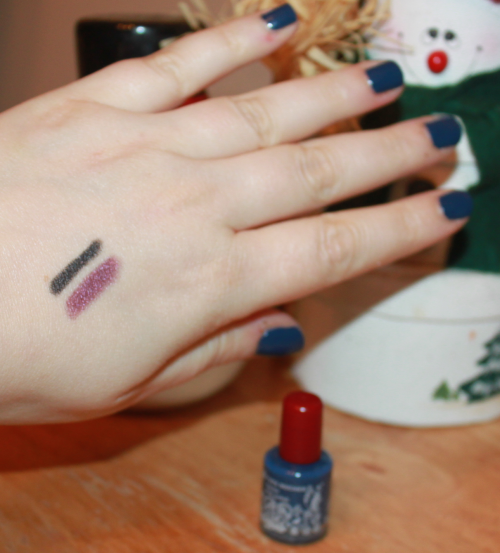 Eye shadows- In the colors Mauve ancien, a deep mauve and Anthracite profond, a deep blue. 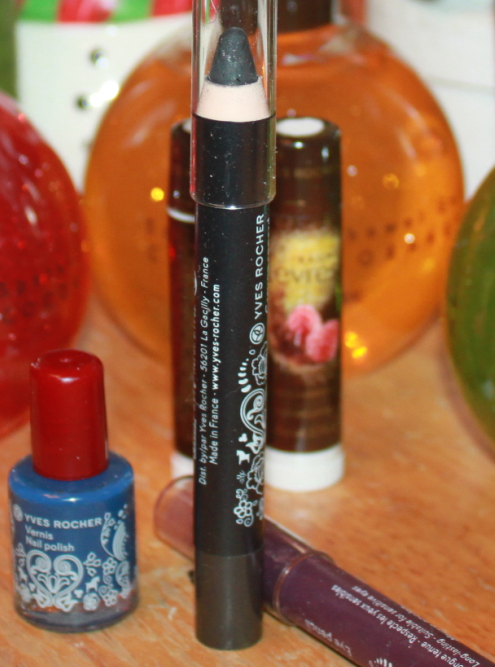 These colors are very pretty and they're perfect for winter! 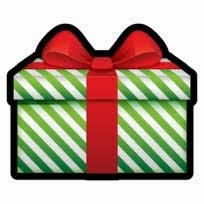 Yves Rocher is always & forever Gift Guide Approved!